Flirty Cuties is a dating site for men and women of any age and sexual orientation. You can browse or search for singles, and use the secure in-platform chat for text, photo, and video messages. Flirty Cuties focuses on appearance, so there’s no long questionnaire about your background, but you’ll still find options to share a little about your personality and what you’re looking for. It’s really easy to join Flirty Cuties. You have to enter your email address and come up with a password, and then confirm it through email. That’s it! Once you have an account, Flirty Cuties asks you to upload a photo and share some basic personal information. Flirty Cuties doesn’t waste your time with any long, boring questions about your interests, background, or personality. It just asks about your body type, hair color, and marital status—though, for anyone who doesn’t want to admit to being in a relationship, there is a ‘rather not say’ option. Once you’ve created your account, you can edit your profile and add more information, like what you’re looking for, if you smoke, have tattoos, and a few other extra details. Flirty Cuties is more about hooking up than finding true love, so it’s not surprising that there’s no matchmaking function. Flirty Cuties does send email updates about members in your area, but that’s only based on geography. You can have fun browsing member photos instead. Flirty Cuties lets you arrange them according to popularity, distance, age, and last activity, so you can start with just the people who have been active on the site recently. You can also view members who are currently online or who live nearby. 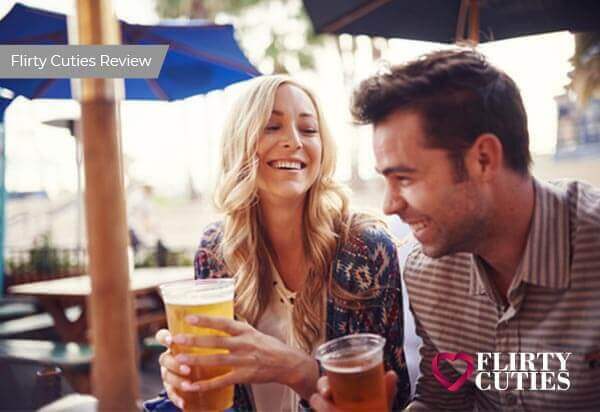 When you find someone to connect with, Flirty Cuties gives you a lot of ways to do it. You can start by winking at a few members who catch your eye, by clicking the ‘wink’ icon on their profile. You could also use a Flirtcast to find more people who are interested. A Flirtcast is a short, flirty message that you can send to many members at once. You can write your own Flirtcast, or use one of Flirty Cuties’ preset messages. Free members who are female can reply to messages from members, while men can’t reply to messages unless they upgrade to a paid membership. As a free member, men can read messages and send up to 5 messages a day. Flirty Cuties has the option to send regular text messages, photo messages, or communicate via video chat. Flirty Cuties also has a Like Gallery feature. It shows you just one profile image at a time, so you can choose if you find them ‘Cute or Not’ by clicking the X or heart icon. Flirty Cuties tells you straight up that you're responsible for your own security on the site. It's up to you to weed out fake profiles and resist scams. You can easily block or report someone who's making you feel uncomfortable, but Flirty Cuties doesn't promise to remove them from the site. The platform does agree to remove any offensive content, although it reminds you that this is an adult site. If you use it, you're agreeing that you're comfortable with the sexual and suggestive material. Flirty Cuties offers an option to become a ‘Verified Member,’ which means that they’ve checked that you’re a real person and not a chatbot. The site doesn’t run any background checks or criminal checks, so Verified Member status doesn’t mean anything about that person’s safety or reliability. If you need a safe space, you can flip on the Flirty Cuties Safe Mode. This way, blocked or suspicious members can't message you, and they're also removed from your search results. You can turn off Safe Mode if you want everyone to be able to get in touch, or switch to Full Safe Mode, which means that only ‘Trusted Members' can contact you. You can join Flirty Cuties as a free member or as a full, paid member. When you’re a free member, you can create and view profiles, read messages in the public chat room, share winks and Flirtcasts, and send up to 5 free text messages per day. You can’t view all of the photos posted by another member—only their main profile photo, and even that one’s cropped. Paid members get to use all types of messaging, to send unlimited messages, use extended search filters, and to view all photos and videos posted by other members. Flirty Cuties does provide an FAQ section, although it’s a little tricky to find. The FAQs are useful and answer to most questions. Flirty Cuties is a great option for anyone looking for fun and casual hookups. You can find true love here too, but the focus is more on meeting new people and making new connections. With plenty of message options, lots of ways to share photos and videos, and a fast and easy signup process, you can start meeting new people on Flirty Cuties.